Via press release from Union Square Hospitality Group, the numbers are in on the 2008 Big Apple Barbecue Block Party, Danny Meyer's annual fundraiser for the Madison Square Park Conservancy and the mother of all fat food blogger chow-downs. First, what Meyer wants you to know most, the event raised $82.5K for the park. Next, mark the calendar, for the 2009 event will take place June 13th and 14th, 2009. Most of the rest of the announcement is here below, including a by-the-numbers look at the impressive display eaters put on in 2008. October 16, 2008, New York - The 2008 Big Apple Barbecue Block Party raised an unprecedented $82,500 benefiting the Madison Square Park Conservancy. Event organizers, including co-founder/restaurateur Danny Meyer, gathered at Madison Square Park yesterday to present a check to the event's beneficiary, the Madison Square Park Conservancy, the organization responsible for the beauty, ongoing maintenance and programming of this historic park. On hand to accept the donation were NYC Department of Parks & Recreation Commissioner Adrian Benepe and Madison Square Park Conservancy President Debbie Landau. 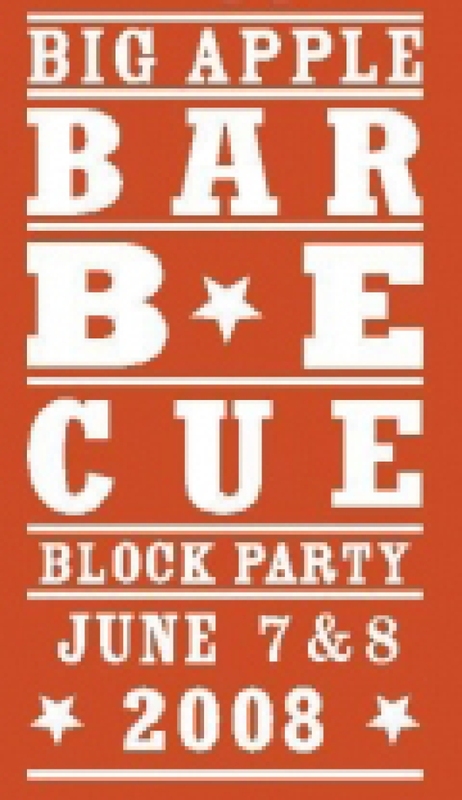 'Cue fans will also be pleased to know that dates for next year's Big Apple Barbecue Block Party are June 13 & 14, 2009, from 12:00 - 6:00 PM, in Madison Square Park. Event organizers are confirming pitmasters and other details now. To get the news first, please visit www.bigapplebbq.org and sign up for our online newsletter to find out who will be cooking, jamming and speaking in 2009, as well as information on FastPasses and other event details.